It’s hard to deny there’s something special about a Shih Tzu, they have such a strong personality and almost regal presence about them. 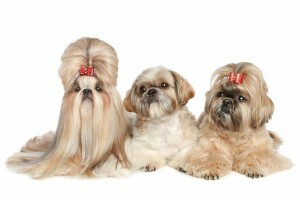 This is for good reason, since the Shih Tzu was bred to be a dog of royal lineage and companionship. These dogs are beloved for their great personality, let’s look at the best of the bark and if there’s any bite to worry about. Some compare the Shih Tzu to cats, and there are some similarities to them, not just because of their petite size and long hair. They are the ultimate “lap dog” and will cuddle up to you as a cat would. Although, Shih Tzu’s are a bit more entertaining than most cats, they know how to cheer you up when you most need it and calm you down when you are feeling stressed. Unlike most small dogs, who get a bad rap for being territorial, the Shih Tzu breed are naturally passive. The only time that you’ll run into a Shih Tzu that is in attack mode is if the owner doesn’t pay them any mind and correct bad behavior over time. A nervous bark is all you’ll ever find from these little angels most of the time. Remember, Shih Tzu look to you for guidance and will be loyal to your wishes and commands. If you are calm, they are calm, because they aren’t naturally meant to guard posts. This goes for many types of dogs, but there’s no denying that when Shih Tzus want to play, they are an absolute joy to be around. Their little bodies and long hair flopping around can look like you’re playing with a little Ewok from Star Wars. They make the cutest faces, too. It’s hard not to smile when those big adorable eyes are starting into yours, that’s what makes these dogs so great for solo companions. You may be tempted to treat your Shih Tzu like the king or queen that they are, but this might lead to disappointment when they betray you for someone who is offering them a nice treat or piece of food. This is what makes them such great dogs to own, they show great obedience to any babysitters or new owners, as long as they get petted and fed on a regular basis. Let’s not think that all Shih Tzus are meant to be perfect little angels. Even if they don’t go after the mailman, sometimes these little guys can be royally stubborn, it’s in their nature. If your dog is feeling themselves, they will make it known. You can see a little stubbornness or maybe a lazy performance of their tricks to get their treats, because they know you’ll give into their undeniable cuteness anyways. Keep a Shih Tzu on their toes and make sure they don’t get too comfortable. Let her know that she is second in line to the throne! After all, you should always be the king, or the pack leader.